• Enjoy 25" of superb screen clarity on a sharp QHD 2560 x 1440 resolution monitor. Plus, you get great color consistency across an ultra-wide 178°/178° viewing angle. • Get exceptional color accuracy and consistency right out of the box, with each monitor factory tuned at 99% sRGB with a deltaE less than 3. • Help boost your productivity with a dual or multi-monitor setup and take advantage of the ultra-thin bezel that is ideal for a seamless, virtually borderless viewing between monitors. • Easy Arrange lets you choose how you view your custom window layout. See all your applications tiled side by side with nothing buried. • Smoothly pivot 90° clockwise or counter-clockwise, placing the thinnest edges side-by-side for an enhanced viewing experience, especially ideal for dual or multi-monitor set up. • The U2515H is VESA-compatible, so you can wall mount your monitor or attach it to the optional Dell Single Monitor Arm. • For convenient connections to other devices in your workspace, the U2515H provides two HDMI (MHL) ports, a DisplayPort, a mini-DisplayPort and five USB 3.0 ports. Quickly charge BC1.2 compatible and other USB devices with a USB 3.0 port found on the rear of the monitor that supplies high-speed charging and powering. Made with eco-friendly materials, the U2515H is BFR/PVC-free (excluding external cables) and has an arsenic-free glass and mercury-free LED panel. 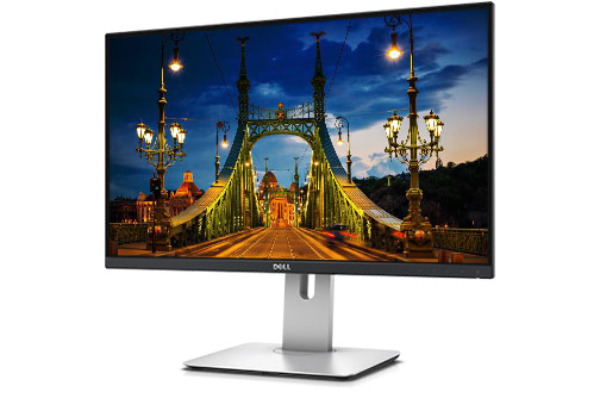 Because it is backed by a 3-Year Limited Hardware Warranty and Advanced Exchange Service, you can purchase your Dell UltraSharp 25 Monitor – U2515H with confidence. Relax knowing that your Dell monitor comes with next business day Advanced Exchange* if your warranty issue can’t be resolved over the phone. Get a higher level of support with ProSupport for monitors which includes 24x7* to ProSupport engineers for set-up, configuration, troubleshooting, and more, as well as next business day Advanced Exchange*.